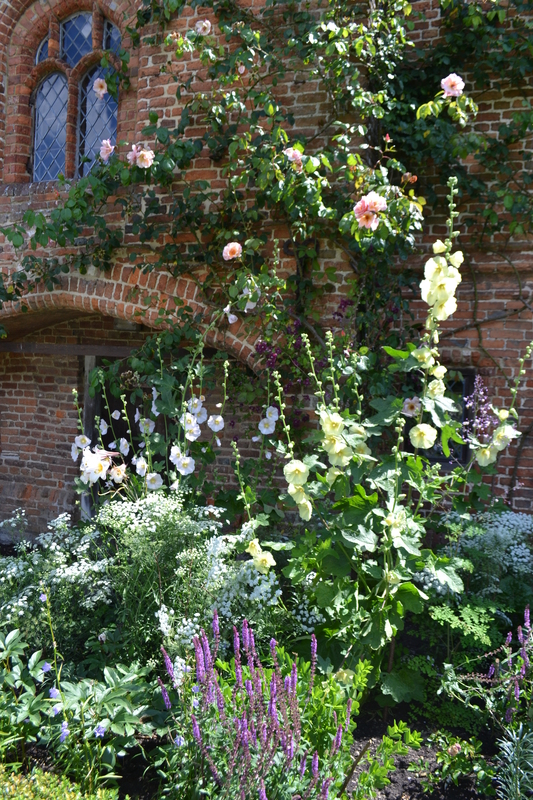 This is my third update about the ‘donkey’ beds near the front entrance and opportunity to share their progress with you, from a Sissinghurst gardener’s point of view. With summer now in full swing and the re planted borders in full bloom, it is the perfect time to see how well the plants are performing and to assess if they have fulfilled their purpose well enough. As you would expect with any newly planted border, the first year’s growth is going to be a bit like a dress rehearsal. Some of the costumes will fit better than others and no doubt one or two of the characters, although well-rehearsed and good all-round performers, will forget their lines just at the critical moment. One such example are the hollyhocks (Alcea purpurea.) The plants here have seemingly grown well. They evoke such a quintessential English cottage garden feeling. The height and colours create good focal points against the solid brick background. But, on closer inspection, some of the foliage shows signs of the ‘Rust’ virus, which produces brown discoloration on leaves and stems and as Troy, the head gardener said, “they have an attractive appearance, but always seem to get rust.” Perhaps the newly dug earth, enriched with organic goodness was too good? They manage to thrive in roadside gardens and may prefer their weaker soils? 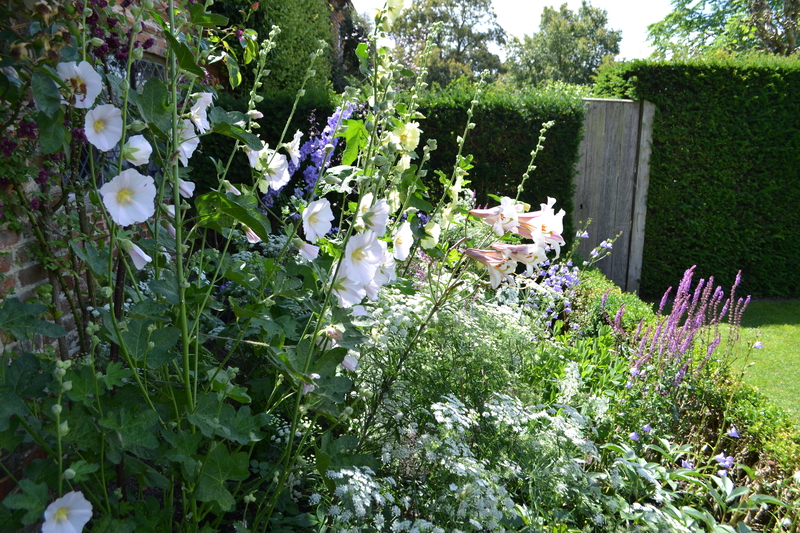 Elsewhere in the garden, other hollyhocks have suffered too. But, to improve the overall display you can remove some of the damaged leaves if need be. The lovely cloudy ‘Thalictrum delavayi’ has behaved oddly too. Yes, the flowers are true to form, but one plant has sprung up like a gigantic geezer, far taller than you would expect. Hopefully, in time the plants will settle, grow in strength and produce a good green mass of fern like foliage, with a purple froth floating above. 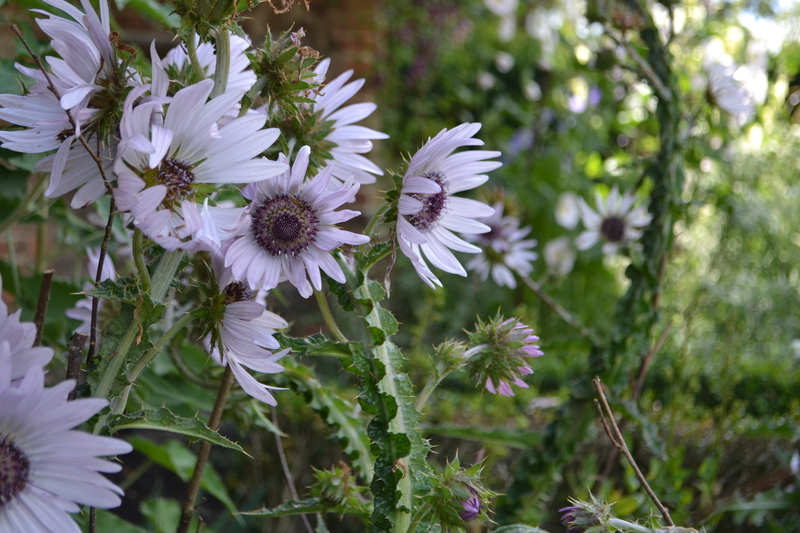 Everyone has applauded the spiny leaved Berkheya purpurea, either side of the great archway. As you can see, the flower clusters are top heavy, so a few hazel pea sticks help to stand it upright. The rising star Ammi major, also gets much attention. Both borders had several streams of these annuals running through them. This umbellifera adds a delicate white fizz of flowers and helps to soften any awkward gaps, while giving a natural relaxed appearance. To build on this, Troy suggests we could “do three sowings,” between August and the following year, to produce a succession of fresh plants which can be used to stretch out the season. And there you have it. Well, there you have some of it. I’ll re visit “the donkeys” another time and let you know what necessary alterations and tweaks have been made in the meantime.